Recycled rubber handbags and tire tube handbags continue to be this season’s hottest fashion trend. Also know as RE3 (recycle-renew-reuse) these rubber handbags are made from reclaimed rubber tires and rubber tire tubes that have plagued landfills since their invention. The recycled rubber tire tube handbags by Aria Handmade are not only eco-friendly, eco-chic and fashion forward, but they make a bold, powerful and beautiful statement on how recycling can and should always be in fashion. Aria Handmade offers rubber handbags, rubber purses and our most popular a rubber messenger bags, all designed to carry what you need for any outing. This year, Aria Handmade, is excited to introduce our newest rubber handbags that use both recycled rubber tire tubes and distressed reclaimed leather. We call it - The Urban Fossil Collection. The Fossil Urban Collection is treading where many rubber handbags have fallen short. 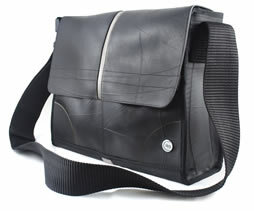 Offering distinctively refreshingly styles and designs that will ensure these recycled rubber tire tube handbags remain - tireless!